Type CH Air Intake Filter Assemblies - Airsan Corp.
Airsan Type CH filter is designed specifically for air intakes on compressors, blowers and engines, with threaded filter housings to enable direct mounting to equipment. 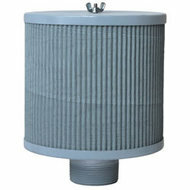 The CH intake filter uses Airsan Type C filter elements consisting of multiple layers of crimped galvanized screen cloth, creating a large surface to stop dust and dirt. To maintain the highest level of performance, filter elements must be recharged with adhesive after cleaning.